The story of what happened to RMS Titanic has touched millions of hearts around the world over the years and we have seen many books, movies and tv documentaries dedicated to the subject. This weekend, as many people realise, is the 100th anniversary of the tragedy. Today it is exactly 100 years since the ship struck an iceberg at approx 11.40pm and in the early hours of tomorrow morning 15 April around 2.20am, it will be 100 years since the ship disappeared beneath the waves of the deep Atlantic Ocean. It seems like only yesterday but it was in fact was 4 years ago this month that I wrote a blog post entitled Ice Cream Class Distinction On RMS Titanic. My family has been interested in the Titanic story for many years - 3 generations in fact - and with my passion for making ice cream I wanted to learn about the food served on Titanic and find out if ice cream had beeen on the menu. 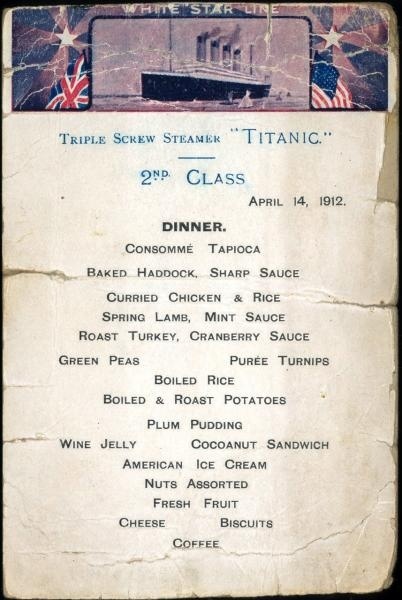 The fact that it was on both the 1st and 2nd class menus on 14 April 1912 - the last day the ship ever saw daylight - was quite a revelation. Moreover, there had been a class distinction in the ice cream served! 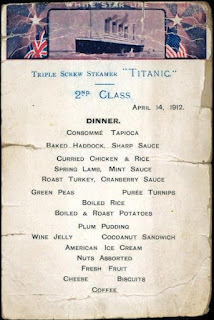 Image: Second-class dinner menu, RMS Titanic, 14 Apr 1912. Repro ID: F5245. ©Walter Lord Collection, National Maritime Museum, Greenwich, London. Courtesy of Royal Museums Greenwich website from whom you can order a high quality print. Thankfully today, 100 years on from the Titanic tragedy, there are fewer social barriers in society and ice cream can be enjoyed by millions. Thankfully today there are more safety measures in place so that, hopefully, nothing on the scale of the RMS Titanic tragedy will happen again. May the courage of those involved in the sinking always be remembered.